We get a lot of emails asking how much it costs to sit the CCNA exam in India and how to locate a test center. Well as of May 2012 the price is $295 USD. You can check the latest price on the Pearson VUE price list, just look for the 640-802 exam code. 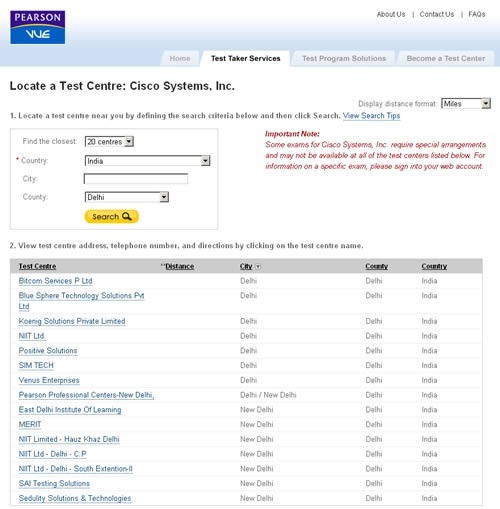 Cisco CCNA exams delivered by a company called Pearson VUE. Go to this page to find a CCNA test center in India. Choose India from the drop down menu and then select your region. Here are some tips for helping to cram for the CCNA exam. The CCNA certification is a good networking qualification whether you are already a networking professional, an IT student or simply looking for a change of career. The route you choose to study for the CCNA exam will depend on your background knowledge and experience. Below we outline the different routes to CCNA certification and who they are best suited to. Cisco Academies – Cisco academies are good for the newbie or career change students. They allow you to attend a local college part-time or full-time and provide the support and hardware to learn in your own time. Search for your local Cisco Academy. Cisco Boot Camps – Boot camps are a quick way of gaining the required knowledge to pass the CCNA exam in a short space of time. They are ideally suited to candidates that have some experience with networking because there is a lot of information to learn and take on board. We offer an on-demand CCNA video training boot camp which will allow you to learn the CCNA from the comfort of your own home. Self Study – If you have the patience and dedication to learn from a book or eLearning course this is probably the cheapest route to the CCNA cert. Beware this route lacks the support and guidance of a tutor, and without Cisco hardware you’ll need to rely on simulators and or second-hand Cisco routers to learn the practical skills. Whatever route you choose, our free CCNA practice questions and low cost CCNA cram sheet will ensure you are fully prepared when it comes to taking your CCNA exam. Unfortunately Cisco CCNA exam questions are not all multiple choice like our CCNA Test. They vary from question-to-question and can include the following types of question. Multiple Choice – Select the best answer from a choice of answers. True/False – Identify the true statement from a selection of statements. Select Multiple Correct Answers – Select all the answers that apply. You are told how many answer options you need to choose. Select All That Apply – Select all the answers that apply. You are NOT told how many answer options you need to choose. Freeform Response – No answer choices are provided, you are required to input your response. Exhibit – You are given a diagram or configuration and asked questions relating to it. Scenarios – Asks a question that you might face in the real world. Simulations – Tests your ability to fix and configure Cisco devices.